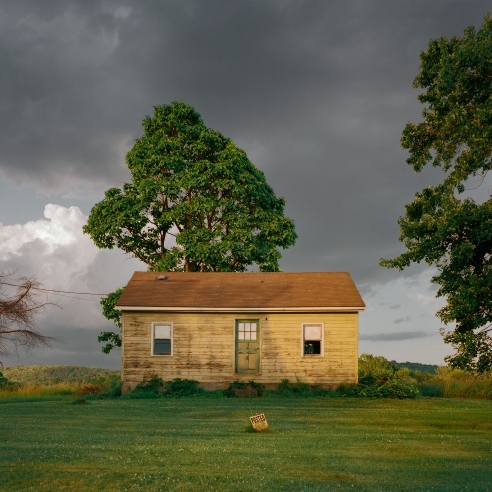 Tracey Morgan Gallery is pleased to present, UPSTATE, photographs by Tema Stauffer. The exhibition features a selection of photographs centered on the intersection of the social, historical, and ephemeral landscape of the Hudson River Valley. UPSTATE was recently published as a monograph with 33 color photographs by Daylight Books. Reception for the artist and book signing to be held Friday, April 12th, 6 - 8 p.m.
Hudson, the geographical outlier of New York City, steeps itself in the afterglow of industrialization and commerce known historically to the region’s origin.The Valley’s sweeping evidence of a once booming landscape lay dormant within the common theme of a collapsed city. Hudson became a landmark for industrialists, and ignited a flame of expansion with the introduction of new technologies in transportation, formation of factories, and a rising tourist economy. Within the understanding of rapid growth, comes an eventual decline, and this is where the photographs of Tema Stauffer become so apt in their ability to see what Hudson is truly presenting. Stauffer offers us the bones of what was, by focusing our attention to the underlying emotional current of human presence set against a decaying landscape. At a glance, the debris of existence across Hudson can be roped into our understanding of a place that is suffering in decline, or even a place that is dying. The inherent cold, frozen in both time and temperature, paints the photographs that Stauffer presents us as an environment where assumably Life cannot thrive. We are shown Furgary Shacks, muted in their color and held in precarious rootedness against the ice glass water notoriously known to snake through the valley. The rear bedroom of the Oliver Bronson House, with its walls of peeling cerulean blue paint, echo the reverberation of a picturesque architectural structure left to neglect. Throughout the work is a dusting of a perpetual sheet of snow, coating the tone of Stauffer’s photographs with a cool observance where she herself remains engaged with the land as it was. Alongside the presumed emptiness of Stauffer’s photographs, is a sharp evening light inseparable to the landscape of the Hudson. The light, piercing through the gray cold demeanor of the work, moves us beyond abandonment and into illumination. UPSTATE doesn’t offer us romanticism, instead it gifts us the truth of a region amassed in contradictions that somehow remain synched. Though human representation is largely muted, the photographs are not devoid. This is the beauty of Stauffer’s ability to humanize a region ravished with struggle. Not only do we meet the eyes of locals through Stauffer’s inclusion of portraits, we see the reminder of lives lived. Through coffee cups left on a diner table, a rusted white car resting in front of a salon, bee traps stacked along the side of a barn during warmer months, we see what can only be perceived as Life.